2016 has seen cool and clever banking apps become all the rage, probably thanks to huge investment in companies like Atom Bank. Innovative startups across the globe are rushing to come up with the “next big thing” in mobile & financial services, so we’re taking a look at some of the up-and-coming contenders when it comes to managing your finances on your mobile phone. By answering some simple questions about your work and lifestyle, Brolly is able to determine which insurance policies a user requires, and to provide some level of intelligence regarding level of cover. However, what’s more useful is the ability to view a complete collection of different insurance policies in one place. Which means no more digging around for old policies. An overall snapshot view of all current, and expired policies, is useful for comparison, and renewal purposes. What we loved: Some will find it intrusive, but Brolly’s ability to scan a user’s mailbox and pull out insurance policies from within is impressive, mostly accurate, and genuinely useful. As is getting a gentle reminder when your policies are due for renewal; now there’s no excuse for not being insured. “An intelligent assistant for your money”. Hook up Cleo to your bank accounts, and “she’ll” tell you where your money is being spent. A simple financial snapshot is not the newest idea, but by removing the app altogether, and sending updates via SMS or through Facebook Messenger, Cleo is unobtrusive, and requires very little interaction or effort. Where Cleo gets smart is that you can text her queries about your balance, and she’ll intelligently answer them - just like a personal assistant. You can ask her: “When does my electric bill come out?”, or “How much have I spent on food this week?” and she’ll give you a smart reply back. It’s pretty impressive stuff. Will it gain traction? We can see this one becoming popular. By integrating through Facebook Messenger and SMS, Cleo is “always on”, so getting a text once a week with your spending is a really useful feature. There are still some niggles in the processing of queries sent, which would need tweaking before everyone wants to “Meet Cleo”. What we loved: Genuinely looking forward to your weekly text message from Cleo, telling you how just much you’d spent at Starbucks this week. Squirrel helps the overly eager spender to better budget their money by withholding funds on a weekly basis. This staggers the user’s access to their salary, for example, meaning they have less opportunity to spend money. As well as this, Squirrel offers the ability to set aside some money to be saved, which is then separated from the user’s main account. Which hopefully means that the temptation to spend one’s “savings” is reduced. Will it gain traction? Squirrel is one of the few apps on this list that offers a subscription pricing, and £3.99 per month is definitely a hefty price to pay, especially for something which is made to save you money. The idea, and the implementation though, is sound, and one we could see the big banks stealing borrowing. As of 4/10/16, Squirrel are running a promotion with the first 3 months of Squirrel for free. What we loved: For those with poor willpower, Squirrel’s financial drip-feed facility is really smart, and saving rather than spending is a habit we could all do with. The idea is very simple - Moneybox tracks your spending, and by rounding-up a small amount on every purchase, and rolling this into an investment account, helps makes you money in the long term. Spend 89p on a chocolate bar, and Moneybox will put the remaining 11p into a stocks and shares ISA. You won’t notice the 11p, but you will when this is applied to every transaction, and is added to a investment account with potentially high gains (or potentially, losses...). Will it gain traction? Because it “does” more, Moneybox does require a more involved setup process than some of the other apps here. The idea is sound, but an average user might not be committed enough to fill out an ISA transfer form and post it to Moneybox. What we loved: The concept. While it’s similar to Lloyds ‘Save the Change’, by putting money into a Stocks and Shares ISA, real returns could be achieved (or losses, or course). Pariti offers users a snapshot of their spending, and provides budgeting tools which allow a user to set a savings target. Pariti then helps the user achieve this target by forecasting how much they will have by the end of the month, minus their bills and current spending. Will it gain traction? The idea of a snapshot of several accounts is not new, but is increasingly popular among consumers. Pariti’s core functionality is simple to follow, so can actually encourage behavioural spending changes. What we loved: Pariti’s default view is one the simplest and cleanest ways to view “how your budget looks this month” at a glance. In-app customer service also works a treat. DiPocket is an app and prepaid debit card which allows users to have a “bank account” with zero/reduced foreign exchange fees. As well as an app, DiPocket give users a MasterCard for all of their overseas spending, advising users that they can "skip the hassle of opening a bank account when moving abroad". Will it gain traction? There are many cards and apps in this space, so competition is tough, however the DiPocket experience is slick, and getting up and running is very quick indeed. What we loved: Add a selfie to identify your account! Your payment recipients will also see this when receiving money from you. Moneyhub simply offers a way to connect multiple accounts and view them all in one dashboard. This gives users a grand total of their finances, giving a true picture of where they stand with regard to their income/outgoings. There's also basic budgeting functionality, which informs users of how their spending has changed month to month, and offers some tips and coaching on saving money in the long term. Moneyhub can also put users in touch with expert financial advisors. Will it gain traction? 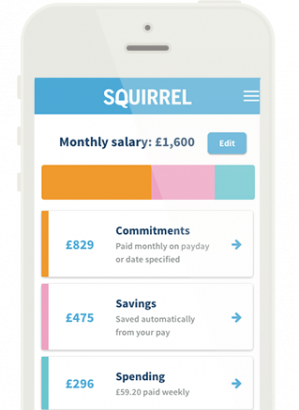 As with similar app Squirrel, saving money is going to cost you money here. Moneyhub has an new annual cost of £9.99 (was £2.99 pcm) which should be a more attractive offering. Unlike many of the other apps here, Moneyhub also has a business version, which will help them attract a different market. The financial app space is changing on a weekly basis, and we can’t wait to see what’s just around the corner. If you’re ahead of the curve and already using some of these apps, please share your thoughts and insight with us, by leaving a review, or see what our community has to say by taking a look at our reviews of these apps.